“Praise God, from Whom all blessings flow!” isn’t a Christmas song, right? But is it? The greatest blessing, our Savior, comes to us this day. Let us sing and praise our God, who in His great mercy, made ready for us. He sent forth His own Son for our salvation. Gloria in excelsis Deo! 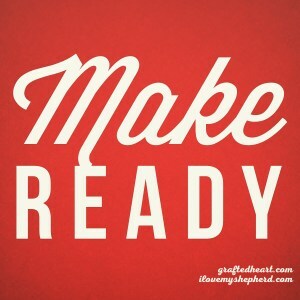 Glory to Him who makes ready His plans for our redemption. We’ve made it to Christmas Eve. If it isn’t done yet, it likely isn’t getting done. Perhaps that’s how Mary and Joseph felt. They made it to Bethlehem, they made it past the gossipers, they made it through this season’s journey to the birth of a healthy child. Even if tomorrow will be full of activity for you, rest in this time, breathe in this space. Be still in the knowledge that God has done this great thing for you. We made ready. Christmas is fun, and special, and a holy celebration. But more than the presents and singing and yummy food, or the babies and lambs and shepherds, angels and wise men, it’s about the difficult road ahead for that little Baby. It’s about His life lived for you and for me. It’s about the suffering endured for you and for me, the cross that lifted our Savior, the grave that hid Him, and the stone that couldn’t keep Him. It’s about His work in our lives. He alone makes us ready for salvation.